The DM&IR "G" Class and "G1" Class Cabeese in "N" Scale from BENCHMARK MODELS, a division of P-B-L, Importers of FineScale Brass Models for over 25 years ! Here's the opposie end of this great litle model. Click Here or on the photo above to see the opposite side of this beauty! Then click on any of the thumbnails below to view others of its type. (They'll open in a new "window" so you won't lose your place. ) We made the "G" class "Long Cabeese" with -5- different road numbers, and they're all here on the web for you to see ! We're accepting ORDERS for these fine models NOW. Of course, one is included with each locomotive, packaged in the same box as a "set". 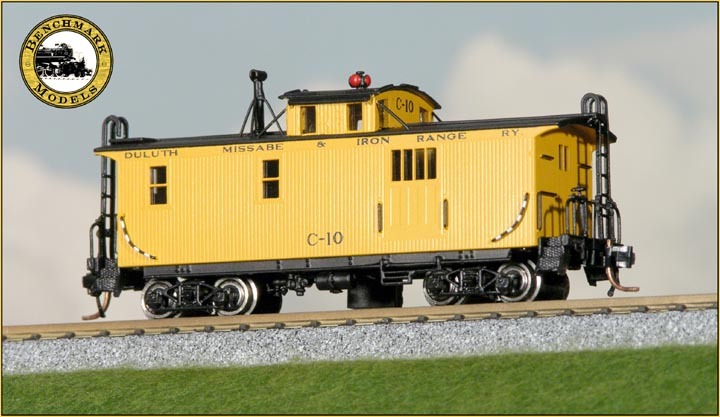 But, a few of these great cabooses have been made available individually packaged. Click Here And we'll email you a link where you can get yourself a printable Adobe Acrobat "Order Form" for these and other "Iron Range" train equipment we now have available. No answering machines. Just live people who like trains! Really ! We're not paranoid, but we did spend a lot of time putting these pages for others to enjoy. So before you decide to swipe photos or text off 'em, you need to know these pages are copyrighted materials. Circa 2003-2005. P-B-L ® All Rights Reserved. You may not use stuff off them without our consent.